I'd just like to start this post out by saying this was by far one of the toughest photo shoots I've had to do! The weather looks absolutely gorgeous (and it was) but the wind was ridiculous. I probably should have checked that before leaving the house in a maxi and a hat but oh well. Too late now! So excuse the pictures (well actually the dress more than the pictures) and my hair. I love finding a good deal. I mean, who doesn't? Unfortunately for me I'm usually too lazy to hunt for said good deal though. Lately I've become much more of an online shopper because of how easy it is. I don't have to wonder what something will look like on (since it never looks the same on as it does on the hanger) and I don't have to dig through trying to find something. It just takes a lot less time which leaves more time for me to do other things. Obviously it doesn't always work and things don't fit or don't look right and have to be sent back but that's a risk I'm usually willing to take. Well it was rainy and just downright yucky out Saturday so I figured what better thing to do on a rainy day than go shopping? I found this dress at Marshall's and fell in love with the colors and even more than that, I was super excited it actually fit me! Being short makes it hard to find maxis that fit without being too long. I decided to go super simple with this outfit and throw on a cute fedora and a pair of simple sandals and out the door I went! Words of advice: maxi dress or skirts on super windy days might not always be the best choice. Although it's probably better than a short flowy skirt! You look so stunning and weather seems divine there. Love this elegant maxi dress. Happy April! Aww thank you Sam! Happy April to you too! I am such a fan of Maxi dresses and probably have about 5 in my collection (not enough). Love this one on you...and you're really making me want a fedora!! I'm seriously obsessed with maxi dresses! I have WAY too many but I can't stop buying them LOL! Thanks love! this is such a cute maxi! So cute! 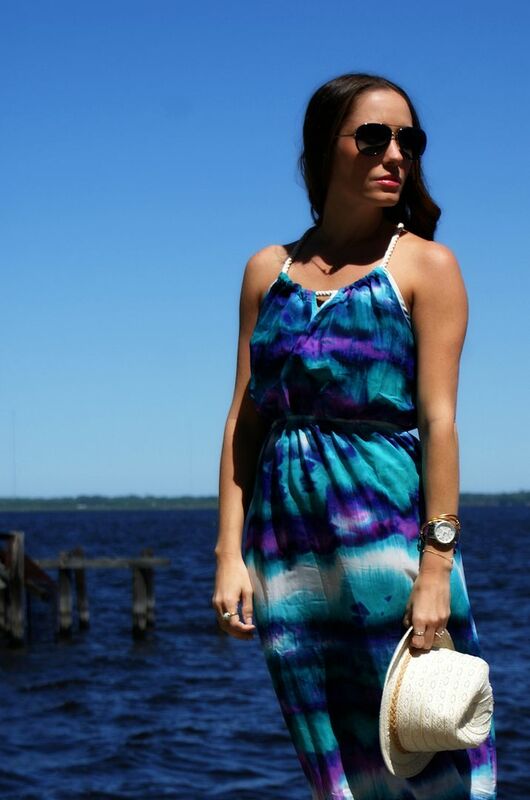 Love the colors on this maxi! Don't you live Marshall's and TJ?! I know what you mean about the wind!! I was by the beach this weekend so it was sooo bad!! Wait until you see my pics tomorrow I'm in a legit wind tunnel! Haha! Thanks Shan! Haha at least we both suffered through the same crazy wind for pictures this weekend, totally annoying but at least it was sunny! That dress is so pretty! Shooting in the wind is difficult, but at least it blows the dress around and makes for some great shots! This print is So pretty! I love the colors! What a gorgeous dress and place!Nice pictures. I am more of an online shopper too.It makes it easy. Thank you! Online shopping is definitely easier! :) Sure! That maxi is absolutely flawless on you! Gorgeous! I love the maxi trend, but am super short and they tend to dwarf me! I just love the feel of all that loose fabric on my legs. Anyway, enough about me! You look amazing!